One thing this is definitely not about: the wishes of the Iraqi people. Local Sunni citizens who are the alleged beneficiaries of these rebels are not polled – they are merely brainwashed, bribed, expelled, beaten, or killed. I have been in Iraq for around three weeks now, mainly in Baghdad. My greatest fears prior to the national elections, of a violent onslaught on innocent citizens and on the fragile Iraqi democratic state, is being realized before my eyes: later than I expected, but to a much more frightening level than either I or others have dared to imagine. The news on television screens and on websites is truly alarming, and yet so many things seem to me here to be so perfectly ordinary. It is another dusty, summer day in Baghdad. Birds are chirping outside. Many analysts rightly now speak of the threat of terrorism facing Iraq, Syria, the Middle East, and the world at large. But the media fervour over the last few days around the monstrosity and intensity of ISIS’s attacks shrouds the political ends that are what the war in Iraq has always been about. Clausewitz once taught that war is simply the “continuation of politics by other means”. In Iraq, the political battle lines were drawn from the day the region’s borders were drawn up by Britain and France, and arguably even long-before then. In the modern Iraqi state, Britain empowered tribes and political figures emanating from the minority Sunni Arab community to rule over the majority Shi’a Arabs in the south and centre, and the largely Sunni Kurds in the north. A Sunni political class was thus born and bred, which would soon become accustomed to the privileges that come from power. Racist, elitist rule needed a justifying ideology, and one was borrowed from the wider Middle East region: the Kurds were the stupid, foolish other; the Shi’a, the heretic, polytheist, paupers who are “more cursed than the Jews”. 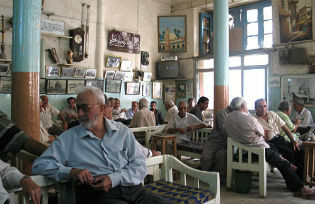 For some years, when the state was weak – such discrimination did not matter as much, but as oil-driven wealth engineered the emergence of a powerful, centralized, intrusive state, racist politics at the elite level came to permeate society at lower levels, fomenting divisions in an Iraqi society historically known for its tolerance, moderation and togetherness. The Iraqi Ba’ath party did not emerge from a vacuum, nor was Saddam a particularly innovative prophet of death. Saddam’s strand of Ba’athism deepened and consolidated the racist Sunni Arab nationalist socialist ideology common in the region at the time. Saddam’s Ba’athists simply went further than others – just as Hitler and Stalin introduced new depths to a racism, brutality and darkness that existed, albeit partly dormant, in Europe and Russia long prior to the era in which either of those two were around. When the US led a war on Saddam, the Sunni world led by the Gulf Sheikhs and the self-appointed Ottoman Caliph, Recep Tayyip Erdoğan, protested loudly. They cited international laws they had never recognized and human rights long denied to their own citizens. Over night, Saudi-funded news channels transformed the broken, corrupted leader that was Saddam into an Arab national hero. No more talk of secular despotic socialism. A suited man with a fine beard and a copy of the Qur’an was plastered across Arab screens: a modern Saladin. Did you not know? He even had plans to liberate Jerusalem! What Saudi, Turkey & Co. were protesting was not the removal of Saddam, nor the likely deaths of innocents. Neither mattered much to the Gulf Kingdoms or the heir of the Ottomans. What caused regional convulsions was the American push to introduce ‘democracy’ to the region, and in so doing, unwittingly to re-draw the maps of old. Turn to the chapter of post-2003 Iraq, and we now meet names with which we are all far more familiar. Welcome to Al-Qaeda in Iraq, and its many acronyms. Meet Aymen Al- Zarqawi. Meet Abo Omar Al-Baghdadi. Meet the Muslim Clerical Association. They are here to liberate Iraq from those infidel occupiers. Wait, but are they really? Why are they targeting innocent civilians instead? Collateral damage, we were told. Why are many of these so-called Islamists former political, military or intelligence chiefs of Saddam’s deposed regime? They must have had a change of ideological heart, I suppose! And then the occupiers withdrew. And new elections were held, first provincial then national. Freely, and before thousands of national and international observers, hundreds of thousands came out to vote. But wait, those suicide bombs did not stop! In fact, they are only intensifying. Because the real war was never with Americans to begin with. The real infidels were not Caucasians, and they did not speak a foreign tongue. Strangely enough, the enemy looks familiar. They are Semites. Most speak Arabic. Many pray and fast, and have names like the fourth Muslim Caliph, Ali, and some even like the Prophet’s — Mohammed! But do not be fooled, they are the true occupiers – of seats that were always meant to be occupied by the same political elite that stage the rebellion today. When ISIS ransacked Mosul last week, what we saw was merely the culmination of what had been taking place over a number of months without much media notice. The official assumption of political power by Al-Qaeda was merely the final nail in a coffin that has been erected around western Iraq, a theatrical production staged under the management of Turkey, funded and broadcast by Saudi, and with Syria’s Assad cheering wildly on the side (his war against his own people will now be a sideshow). Importantly, Al-Qaeda made a fitting choice for their new governor: formerly a senior Ba’athist charged by Saddam Hussein to run his network of palaces in the 1990s. His appointment is a microcosm of what terrorism in Iraq is really about: a Ba’athist-jihadist alliance seeking to restore absolute Sunni Arab minority rule. Moderate Sunni leaders who believe in democracy, power- sharing, or who believe in a national identity that transcends sect, are killed or scared away. The rest of the Sunni political leadership fall in line: either out of fear; because they never believed in democracy anyway; because Gulf money transfers make it lucrative to do so; or because the racist traditions of superiority still run deep in their blood. Hence the fate of the army that simply melted away. The Iraqi army’s collapse is partly a story about ill-equipped, ill-trained troops failing in battle. But that is only a small part of the story. A big part is about all those starred generals who were bribed and told to desert their posts. And an even bigger part of the story is of very senior Sunni Arab generals merely handing over the regional keys to power to Al-Qaeda without a fight, because who was going to fight for a political order that did not represent them anyway? The response from the north has been equally consistent with the history of this conflict. The Kurdish leadership saw the latest Al-Qaeda offensive as another opportunity for its own expansion, quickly sending the Peshmerga militias to seize power in disputed territories like oil-rich Kirkuk. Sympathizers of the Kurdish leadership (including handsomely paid western lobbyists) contend that these posts were disserted and hence that the Peshmerga are doing the Iraqi army a favour. But there are sufficient reports of Iraqi soldiers being forced to abandon posts at gunpoint by the Peshmerga such that few serious analysts take the Kurdish party line seriously. Baghdad, the capital, is next. It is the prize target. And thereafter, Karbala, Najaf and all other Shi’a cities will fall — so goes the popular rebel logic. This much Iraq’s Shi’a leadership understands. Initially blindsided by the shocking pace of the Ba’athist-jihadist onslaught, and the feebleness of the army defence, previously divided Shi’a leaders have now come together. New troops are being rallied, and old and new militias are remerging, filling the security vacuum in and around Baghdad. And Iran is quickly sending advisors, arms, and possibly fighters too for support. As if to underscore the seriousness of the potential battle that lies before us, Ayatollah Sistani’s main representative in Najaf delivered a stunning Friday sermon earlier today. Sistani has been the benchmark for urging unity and restraint since 2003. But his chief representative’s sermon carried a different message today. It was a national call to arms. A call for every able-bodied male to volunteer to fight. To fight back against the Ba’athists and terrorists. To defend Baghdad and the south. And to liberate moderate and peaceful Sunnis in Mosul and the rest of the north. The tone of the sermon has taken everyone by surprise. There was no compromise, no mincing of words, and no shying away from the conflict. Most Iraqi news channels have been repeating those words since, and thousands are calling in from the south and centre to say they will heed Sistani’s call. Sistani’s words are likely to echo hauntingly in the corridors of power in Turkey and the Gulf Kingdoms. Now that the Iraqi Shi’a have rallied, with Iran closely by their side, are King Abdullah and Caliph Erdogan ready for an all-out Sunni-Shi’a conflict? And what of the United States? What role does the world’s remaining superpower have to play? This international dimension has always been at the focal point of the Iraqi conflict: calm US-Iranian tensions, and turn off the Turkish-Saudi taps, and the Ba’athist-jihadist onslaught would arguably dissolve into a whimper. Or so the internationalists believe. We thus stand today at what may prove to be the most significant junction in Iraq’s modern history. If the Ba’athist-jihadist alliance continues its offensive, with Turkey and Saudi supporting it behind the scenes, and the Shi’a now fully stirred up and ready for the fight, then we will likely see flashes of a brutal civil war and the final breakup of modern Iraq. Or perhaps we will not. Perhaps Sistani’s uncompromising stance and the reunification of Iraqi Shi’a leaders with Iranian support will frighten Al-Saud and the neo-Ottomans. Perhaps the United States will intervene behind the scenes and make it clear to the Turks and Arabs that Iraq’s sovereignty, territorial integrity, and democratic political order are red-lines. A pseudo-federal Iraq may be the compromise solution, with Maliki (despite election results) asked to kindly step aside and let a less divisive Shi’a leader take the premiership. Boosted by its early victories, perhaps Al-Qaeda will overstretch. Perhaps their rule over Mosul will collapse internally, as Sunni Iraqis experience the hollowness of the ba’athist- jihadist promises, and the brutality of their rule over their very own. As I type these words hurriedly, concerned there will be a power cut that will mean I cannot post my ramblings to my friends outside Iraq, the sun continues to shine intensely on Baghdad. Shops and restaurants are open as usual. The Tigris and the Euphrates continue to flow as crowds of palm trees stand, huddled, bent-over, anxiously watching over what the people of great Mesopotamia have been reduced to today. Perhaps these are signs that despite modern history, despite the intentions of power, despite international intrigues, and the frenzied cries of traditional and social media outlets, Iraq and Iraqis are here to stay. Somehow, the country will tilt back away from civil strife. Its people, weary of war and conflict, may somehow come together again. Or perhaps not. Perhaps these signs of apparent normalcy are merely features of the clichéd quiet before the much-too-analyzed Iraqi storm. Perhaps the humid breath I take right now, the chirping birds I hear, the dusty, arched palm trees that watch over me – perhaps these are some of the last moments I will experience in the land we call Iraq.